Why do we gamify corporate learning? To motivate employees! But it’s easy to get lost in the buzz of gamification. Motivation is a living thing, and it changes by audience, by context, by goal. There’s no one way to motivate that works in every learning situation. Sometimes effective gamification just means showing learners their own progress through the course. Sometimes it means tapping into that good ol’ competitive streak and engendering friendly competition. Sometimes effective gamification removes head-to-head competition from the equation, keeping the experience light and fun. What type of audience do I have? Are they highly competitive? Is this a required or an optional course? How does this course further their career? Do I have one fairly homogenous audience, or learners in a set of sub-groups? How has my company historically defined completion for learning events? How might I enhance or revise that definition of completion with a gamified approach? How will I communicate completion requirements clearly to the course audience? How will I know if I’ve succeeded at making them clear to the learners? Ultimately, what you want learners to do, and how you get them to do it, depends primarily on two things: the learning initiative and the audience. You must be intentional in identifying and deploying your gamification strategy – then the rest will fall into place. So with the above questions in mind for your own programs, I’d like to share two approaches I’ve used recently to motivate learners. To illuminate the different strengths of the “points for completion” and “badges for completion” gamification options, I’ll share the types of design questions you should ask first, and then two examples of the approaches in practice. Points for completion is a common approach for a good reason: it works pretty well for a lot of learning programs. With a little communication up front about how to get points and how many points there are to get, learners are off and running with a goal and milestones in mind. It’s a framework we’re all familiar with and understand. I find that this approach works particularly well with a highly motivated, Type-A, competitive, and somewhat autonomous workforce. What point value will you assign different types of assets? When engaging with a points-based learning experience, learners will expect a clear and understandable point scale. They’ll look for ways to prioritize and rank assets – and point value allows them to do that. Ask yourself: what is the critical driver of the course? Is it the passive consumption of content in the form of video and documents? Is it peer-to-peer engagement across teams? Is it assignment completion that demonstrates competence? Value your assets accordingly and clearly communicate it to learners. Is completion a measure of success in the course? If so, what percentage of total points will you require for a learner to pass? This question and its answers will vary greatly based on the type of learning initiative you are undertaking. ♦ Map out the total points possible for the entire course, including all optional points. ♦ Establish “critical” assets that must be completed regardless of total point value (this usually includes course outputs, weekly assignments, and collaboration options). ♦ Set a realistic pass rate for learners – many companies opt for the 80% threshold. Make sure to communicate this early and often to learners, and break it down by week or course segment, so participants can track their progress. Will you offer learners the chance to complete “optional” assets for points? If you’re choosing the points-for-completion methodology, you’re most likely designing the course for a competitive audience. So be careful with additional or optional assets. 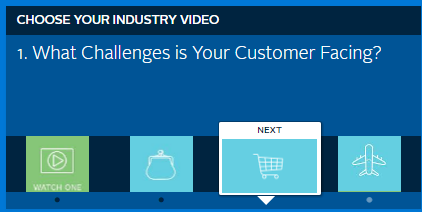 Even the best intentions go awry with optional content. Once you assign a point value to optional content, learners will feel more pressure to complete it. This becomes problematic when you have already communicated course time estimates. Don’t break that trust with your learners. My recommendation? If an asset doesn’t make the cut for “required” — include it in the course without points. This offers learners an opportunity for further research into the topic, and sidesteps the issues with additional points. Have you fully communicated the point-for-completion strategy to your learners? Don’t leave your learners guessing. Communicate the strategy before the course launches, and clearly identify passing thresholds at intervals throughout the course. Most frequently, in a points-for-completion strategy, I find that learners are most concerned about where they stand, how many points they need, and if they’ll pass the course. Here’s a real-world example: Microsoft’s “Business School” MOOC series focuses on business strategy and financial acumen for global sellers, supporting the business’s shift to a mobile-first cloud-first company. The learning approach is a cohort-driven, semi-synchronous experience, with content rolled out weekly over six to eight weeks. Each of the three courses in the program (which has been going gangbusters for nearly two years now) awards highly sought-after digital completion certificates from business school content providers Wharton and INSEAD. We’ve written a lot about the external badging and course completion rates before (see here, here and here), but it’s the motivation built into the inside of the course that I want to focus on. Content is assigned a clear point structure that placed a higher value on participation and activity. Static content (read & watch) is 10 points. Discussion forum participation is 20 points. Weekly applied-learning assignments, 100 points, reflecting their criticality. Optional and additional content is just 5 points. Participants are required to earn 80% of required points to pass, as well as submit the final assignment and participate in peer review, reviewing at least 5 other sellers’ assignments. And it worked! Sellers were eager to devour content and complete assignments, all the while watching their points accrue (and name ascend) on the Leaderboard. (That the content and real-world assignments were all incredibly relevant to their work also helped, of course). Organizations that need clear completion thresholds for learners. This is typical of companies that are bound by external regulations or accreditation standards. Creating various levels of “passing” a course. Consider establishing point tiers to signify completion and distinguish between those who met the basic requirements, and those who went above and beyond. Now let’s consider a different gamification approach. Digital badges within a course can be used to merely indicate progress (Week One Completed, Week Two Completed) and that can be satisfying to some learners, but a more exciting way to leverage such a powerful gamification tool is by tying badges directly to demonstrated capability. The choice to deploy a badge-for-completion approach should be deliberate and intentional. Does your course include multiple audience groups that may need to complete different assets? On a basic level, badges-for-completion allows you to strategically identify critical assets for learners. But more than that, it allows you to simplify the learner experience across groups. Generally speaking, course outputs like assignments/activities and discussion forums are expected of the entire course population. This increases course engagement and allows for cross-pollination of ideas. However, you may find that other assets, like particular videos or documents, are more relevant to one learner sub-group than others. Here’s where badging allows you to simplify the complexity. Instead of an across-the-board point value for completion, you can tie specific assets to learner completion that varies across groups. For instance, your learner groups might be required to complete content specific to their own region but not others. Or a learner group of, say, experienced managers in a change management strategy program might be required to complete a different learning path than first-time managers. The badging approach can work quite well for learning audiences that cross verticals, geographies, levels, or industries. How will you determine which assets to tie to a completion badge? Choosing assets for course completion should be a deliberate and intentional process (are you sensing a theme here?). Don’t waste the learner’s time by requiring content that is not critical to demonstrated competence. Pick assets that are critical to the learning experience – and satisfy any internal measures for completion. This usually includes activities, assignments, and group-specific content. Be aware that learners accustomed to a points approach may struggle at first to make the leap to the capability badging approach. Communicate completion requirements carefully and clearly, so learners aren’t left wondering if they did what was required. Confusion is a death knell for a gamification effort. You may also consider keeping points as part of the course to drive competition, in addition to demonstrated capability badges. I’ve found that learners in a badge-for-completion scenario will be more likely to complete additional assets, and expand their learning beyond the minimum requirements, when points are attached. 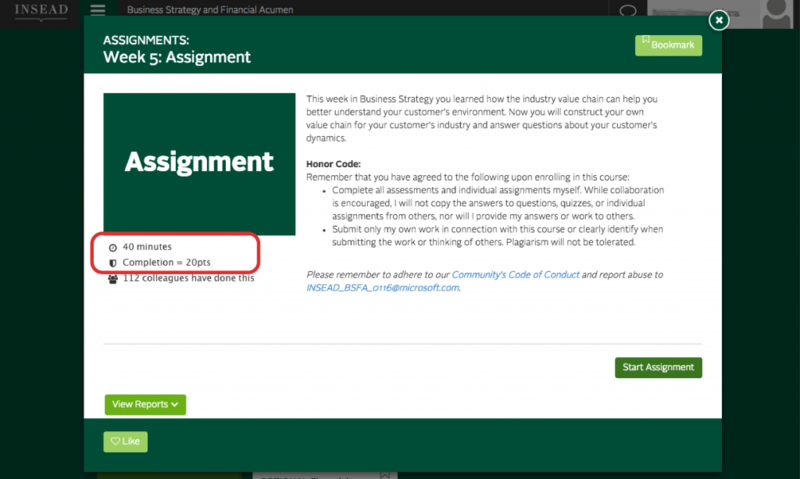 Let’s take a look at using badges instead of points for the same competitive Microsoft salesforce as the above “Business School” example, but for a different course and different learning goal. Microsoft’s “Digital Transformation” MOOCs, just recently launched, were designed to emphasize the role of the industry in the digital transformation space. The course relied on external expertise to augment Microsoft industry-specific resources in order to upskill sellers to have meaningful conversations with their customers. Where the Business School MOOCs brought an air of gravitas to the experience appropriate for its lofty goals of transforming the entire sales approach, the Digital Transformation MOOCs required a lighter, pithier feel. Just three weeks long, the courses needed to feel different top to bottom, so we designed them with a brighter color scheme, and a wildly different use of points and badges for a sense of lightness, but one that still drove completion and retention of learning. 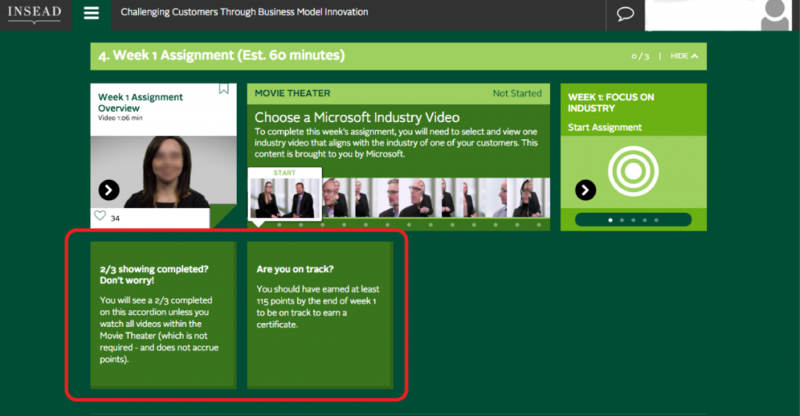 Four courses were created as part of the Digital Transformation MOOC series, each emphasizing a distinct industry vertical within Microsoft. Within those industries, we needed to further drill down to sub-industries, and funnel participants through the course in a way that gave them maximum exposure to their identified sub-industry while also ensuring they completed the right activities and complementary content. We knew the standard points-for-completion approach wouldn’t be enough to validate industry-specific completion. So: badges. As part of their first engagement with the course, sellers indicate which is their primary industry and sub-industry (for example: the Retail, Consumer Goods, and Hospitality course included three sub-industries). The badges are directly linked to knowledge gained, not just points accumulation or course progression. We did also use points as part of the course design for those going after the “fame and glory” in addition to new understanding of their customers, since although this course has different goals and atmosphere, it’s still for a competitive Microsoft seller audience. 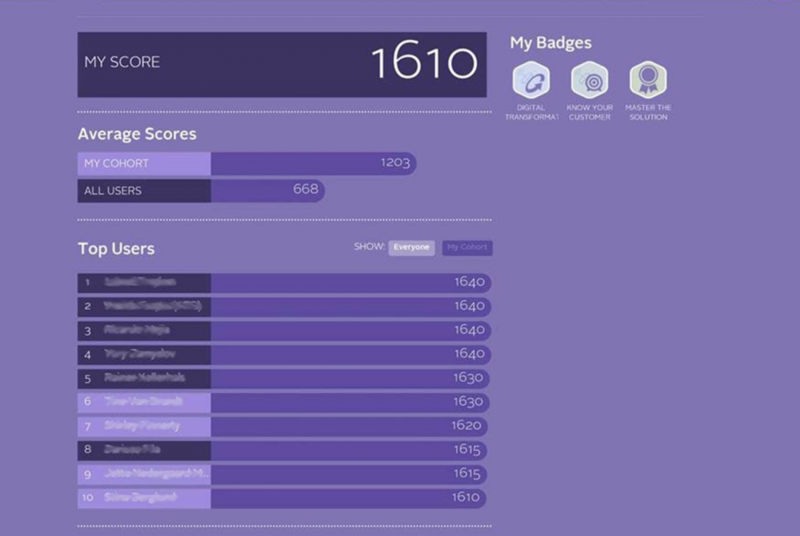 Badges demonstrate learning, but it takes points to top the Leaderboard, and participants can get up there by completing content that is aimed at industries outside their chosen focus. 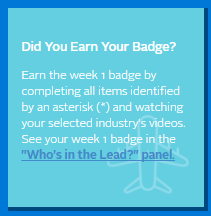 At the end of each week, participants are asked “Did You Earn Your Badge?” and given a link to the Leaderboard panel. This made it easy for them to both validate completion and to see who’s in the lead. Courses that don’t require a formal completion metric, but are geared towards competency. Company cultures that value collaboration and social learning over simple point accrual. Badges are very useful in grouping content to document the strategic completion of a concept or idea. Establishing completion across roles within an organization. This approach has worked well for companies needing to validate the completion of content for managers versus employees, seasonal versus full-time workers, remote versus onsite employees, etc. Two learning goals. Two gamification approaches. Same audience in these particular examples—but you can apply the same principles and questions to different audiences and learning and business goals too. The important to thing to remember is that gamification takes time to define. To be successful at motivating learners, the reasons for choosing one tool or another (or several) have to be thought through, and must align with your overall business and learning goals. Done poorly, gamification is just another impediment to real learning. But applied with forethought and care, gamification can be a truly effective (and fun!) motivator.